Q: Where can I find the FAA Approval Letter for 8.50 x 6, 4 ply tires on Cessna 170, 180, 182, and 185 Series Aircraft? A: You can view the letter here: FAA Approval Letter for 8.50 Tires. Q: Where can I find the STC to use PA-18 control surfaces on J3, J5, PA-11, PA-12, or PA-14 Series Aircraft? A: Please contact Ann Wibur at (907) 250-2641. Q: Where can I find the STC to use PA-18 control surfaces on PA-20 and PA-22 Series Aircraft? A: Please contact Josh Svenningsen at Svenn’s Aviation, LLC. You can email Josh at svennandsons@yahoo.com or visit his website at http://svennsaviation.com/stcs/. Q: Where can I find an STC for PA-20 or PA-22 weld on float fittings? Q: Where can I find STC’s for short wing Piper parts? Q: Where can I find information regarding STC’s owned by Day and Night, Inc.? A: Please contact Ron Sullivan at (907) 345-4630. Q: Where can I find information regarding STC’s owned by Crosswinds S.T.O.L., Inc.? A: Please contact Charly Center at (907) 376-8069. 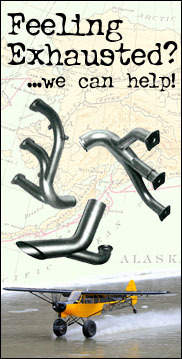 Q: Where can I find information regarding STC’s owned by Alaskan Aircraft Products? A: Please contact Butch Cavanaugh at (907) 376-7070. Q: Where can I find information regarding STC’s owned by Performance Air Motive? Q: Where can I find an STC to use PA-20 Tailfeathers on J3 Series Aircraft? A: Please contact Kindred Aircraft Maintenance at (701) 428-9954. Q: Where can I find information regarding STC’s owned by Roger Borer (M R Borer)?